Week one is in the books and I know everyone tried their best and did an amazing job. I love hearing stories about how people are preparing for their weeks and seeing the wonderful support system we have in our community. When week one passes some of the newness and excitement wears off and you realize you have five weeks to go. I love the quote, “commitment means staying loyal to what you said you were going to do long after the mood you said it in has left you.” That quote will ring true many times in the next couple of weeks. Week two can also come with some minor aches and pains as your body adjusts to life without processed foods and learns to refuel itself properly. Don’t be alarmed if energy drops during the second week. This is pretty normal and make sure you are getting great sleep, staying hydrated and eating enough. Once it passes — and it will — the good stuff will happen: energy on an even keel, mental clarity, stability in your mood, and better sleep. Just stick with it! I am more than happy to look at food logs of anyone who needs an extra set of eyes on what they are doing. If I am not in the gym the day you bring it in just simply leave a copy for me in the office and I will look it over for you. Don’t forget on Saturday January 30 I am meeting with anyone who needs to at 11:00 for a “shoot the s%#” with Amy session. Basically venting, celebrating, measuring, and whatever else you need to do to remain successful in the next three weeks. Workout One: 8 Rounds: 10 walking lunges, 10 sit-ups, 10 push-ups. When complete go for a 20 minute easy run or walk. Workout Two: AMRAP 20: 50 Jump Ropes (If you don’t have a jump rope mimic the movement), 40 mtn. climbers, 30 squats, 20 burpees, run/walk for 2 minutes. Meals this week with the exception of dinners will remain close to the same. Breakfast for me will involve eggs, broccoli and spinach, bacon or avocado with some black coffee. Lunches will be grilled chicken or lean meat with more fresh veggies, or salad with lots of avocado. Lunch tends to be a time I like to have something sweet so I will be prepared with a small serving of fruit like berries or an apple. Snack will be a smaller version of lunch, or leftovers from the night before. Dinners will be the following attached recipes. I am a creature of habit so many of these things will be repeated throughout the course of the challenge. Recipe 4: Chicken with Salsa: I simply take several packs of chicken breasts or thighs and throw them in the crockpot in the morning with a bunch of fresh salsa and paleo taco seasoning. I cook it all day and then shred it up when I get home. We serve it with lots of steamed vegetables and plenty of fresh tomato and avocado. * I know this is only four meals, but I often double if not triple recipes so Jason and I have lots leftover to repeat meals and for lunches and snacks. I also have breakfast for dinner at least once a week. The boys love it and I think breakfast foods are my favorite. * Snacks I keep on hand at the house are hard boiled eggs, lots of cut up veggies and some fresh fruits, and cut up strips of chicken. I don’t do too many nuts or nut butters because I feel like I have a hard time controlling my portions with those. Last week we focused on gratitude, this week we will focus on thankfulness. At some point this week stop and make a list of twenty things that you are thankful for. I guarantee most of your list is comprised of your loved ones. These people are the biggest reason for maintaining your health and becoming a better version of yourself. Post this list on your fridge, bathroom mirror, or pantry. This will serve as a constant reminder when you are tempted to binge of some of the many reasons you are committing to this challenge. Breakfast is one of the biggest challenges people struggle with when they go Paleo. We’re accustomed to starting the day with refined, processed carbs, such as cereal, oatmeal, bagels, and pastries, and a big ole cup of coffee, aka Starbucks Dessert in a Cup. All the caffeine and carbs kick start the morning, but unfortunately it sets you up for a day of blood sugar highs and lows, mood swings, and sugar cravings. People understand that doughnuts and syrup-laden waffles are off limits during a Paleo challenge, but we get a lot of questions about oatmeal. Why no oatmeal? Well, oats are restricted from the Paleo diet because they are an inflammatory food. They contain a large amount of phytic acid which blocks the absorption of minerals in the body. Although some people soak the oats overnight, causing them to be less inflammatory, for the sake of this Paleo Challege we’re avoiding them entirely. Upon learning this, most people then eat eggs. Every. Single. Day. For some, this poses no problems, but for others, their GI systems are unable to tolerate it. Also, newbies to Paleo will try and recreate meals/cheats using Paleo ingredients, such as Paleo pancakes and muffins. 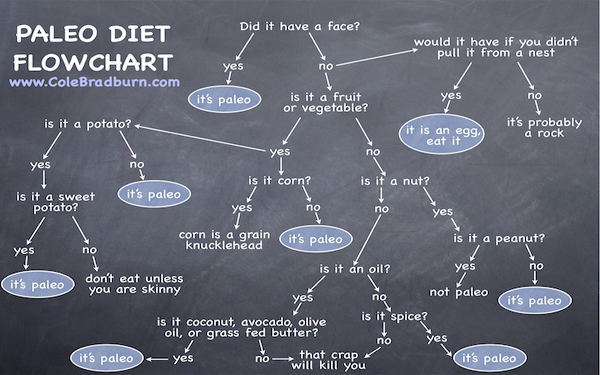 Please note that just because “it’s Paleo” doesn’t mean you can have it everyday. A Paleo treat is just that – a treat. If you wouldn’t have it daily before Paleo, so don’t consume it daily during the challenge. Yes, it’s a healthier version of the food, but it’s not ideal. Also, there are many recipes out there that call for special ingredients that you can only find in specialty stores. If cooking and trying new recipes is your thing and you have the time, by all means experiment and create! For those of you less inclined to attempt gourmet meals (that would be me! ), make it easy on yourself. Stick to the basics and keep up with the Facebook group – they are a wealth of resources, short cuts, substitutes, and encouragement. Think of this as a lifestyle change and gradually make it something you can sustain. To increase your success with eating Paleo, try not to think of food in terms of breakfast, lunch, and dinner. Think of meals as meals, to be consumed at any time during the day. One of my go-to morning meals is leftover chicken and veggies. Also, treat morning meals like your other meals – plan, prep, cook, and measure them out ahead of time to keep yourself on track and reduce the morning craziness. Here are some links to morning meal ideas. I haven’t tried all of these and you can be creative with them and let us know your thoughts. Good luck!